Three times more moisture absorbing than cotton, naturally anti-bacterial and silky-smooth underfoot, bamboo fibre makes great shoe liners. 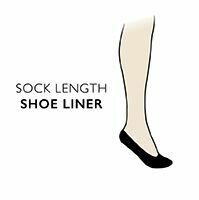 So naturally, using Elle Bamboo Shoe Liners make wearing even the warmer, stickiest or least foot-friendly shoes a pleasure. These seamless shoe liners are near-invisible in most shoes, even those low sided court shoes. Clever weaving design adds extra hold where it’s needed to keep these stretch fabric liners in place for all day round comfort.